This unidirectional data stream typically consists of 14 to 20 data words representing primarily sensor inputs and three outputs; injection pulse width, spark advance angle, and idle speed control command. Data is transmitted at a rate of 100 baud, updating on the Diagnostic Tester display approximately once every 1.25 seconds. Depending on application, the data is accessed from either DLC 1 or DLC 2. 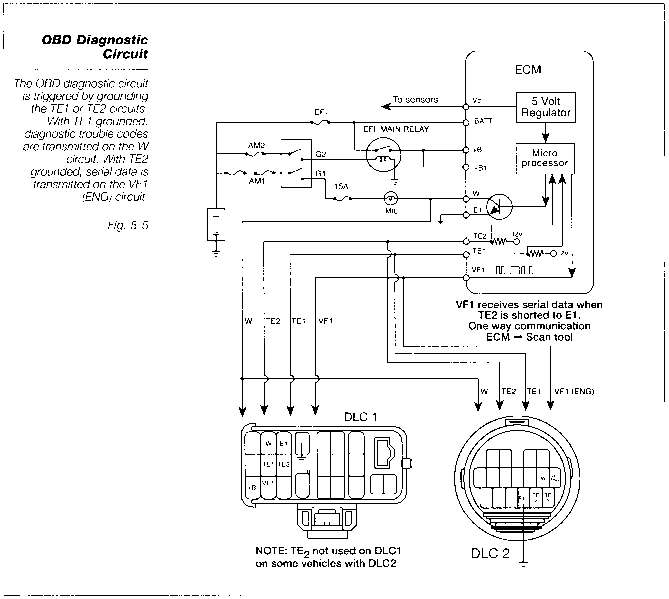 Data is triggered by grounding the TE2 circuit and reading the VF1 circuit. Diagnostic Trouble Codes can be displayed using the Diagnostic Tester or by grounding the TE1 circuit and counting the Malfunction Indicator Lamp (MIL) flashes. The scan tool reads codes by counting the low voltage pulses on the W terminal of the Diagnostic Link Connector (DLC). Therefore, code retrieval is a relatively slow process, especially when multiple codes are stored. Where is obd2 connector for 02 4runner?